iOS 7, introduced in 2013 as a profound redesign, was a statement from a company ready to let go of its best-selling OS' legacy. It was time to move on. 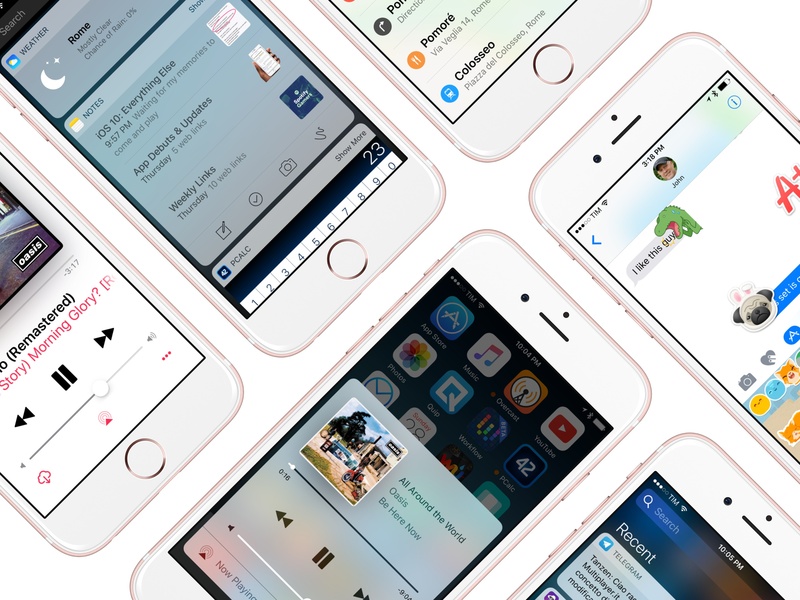 With iOS 8 a year later, Apple proved that it could open up to developers and trust them to extend core parts of iOS. In the process, a new programming language was born. And with last year's iOS 9, Apple put the capstone on iOS 7's design ethos with a typeface crafted in-house, and gave the iPad the attention it deserved. You wouldn't have expected it from a device that barely accounted for 10% of the company's revenues, but iOS 9 was, first and foremost, an iPad update. After years of neglect, Apple stood by its belief in the iPad as the future of computing and revitalized it with a good dose of multitasking. Gone was the long-held dogma of the iPad as a one-app-at-a-time deal; Slide Over and Split View – products of the patient work that went into size classes – brought a higher level of efficiency. Video, too, ended its tenure as a full-screen-only feature. Even external keyboards, once first-party accessories and then seemingly forgotten in the attic of the iPad's broken promises, made a comeback. iOS 9 melded foundational, anticipated improvements with breakthrough feature additions. The obvious advent of Apple's own typeface in contrast to radical iPad updates; the next logical step for web views and the surprising embrace of content-blocking Safari extensions. The message was clear: iOS is in constant evolution. It's a machine sustained by change – however that may happen. It would have been reasonable to expect the tenth iteration of iOS to bring a dramatic refresh to the interface or a full Home screen makeover. It happened with another version 10 before – twice. And considering last year's iPad reboot, it would have been fair to imagine a continuation of that work in iOS 10, taking the iPad further than Split View. 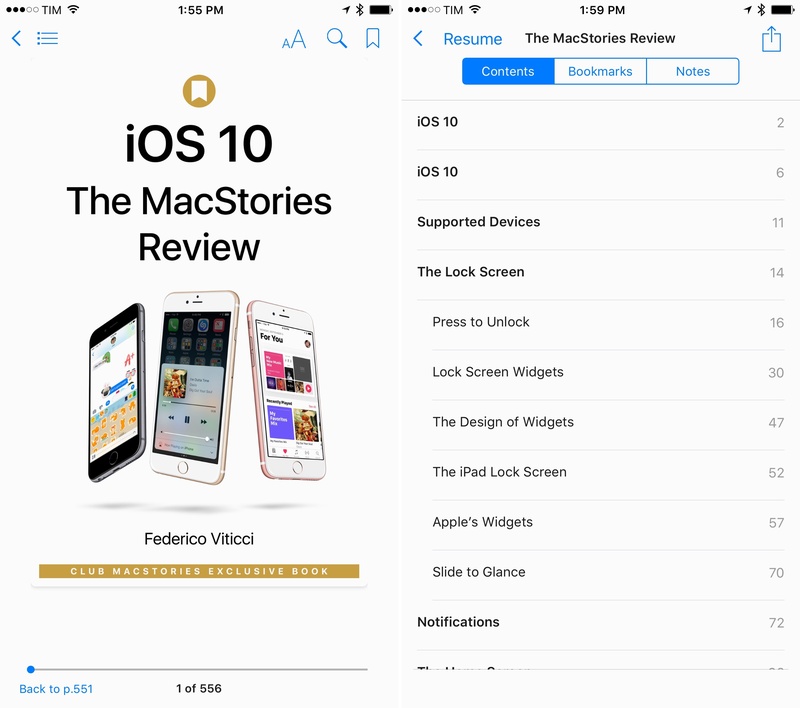 There's very little of either in iOS 10, which is an iPhone release focused on people – consumers and their iPhone lifestyles; developers and a deeper trust bestowed on their apps. Like its predecessors, iOS 10 treads the line of surprising new features – some of which may appear unforeseen and reactionary – and improvements to existing functionalities. iOS 10 is a major leap forward from iOS 9 – at least for iPhone users. Even without a clean slate, and with a release cycle that may begin to split across platforms, iOS 10 packs deep changes and hundreds of subtle refinements. The final product is a major leap forward from iOS 9 – at least for iPhone users. An eBook version of this review is available exclusively for Club MacStories members. Club MacStories offers access to weekly MacStories extras – including workflows, app recommendations, and interviews – and it starts at $5/month. 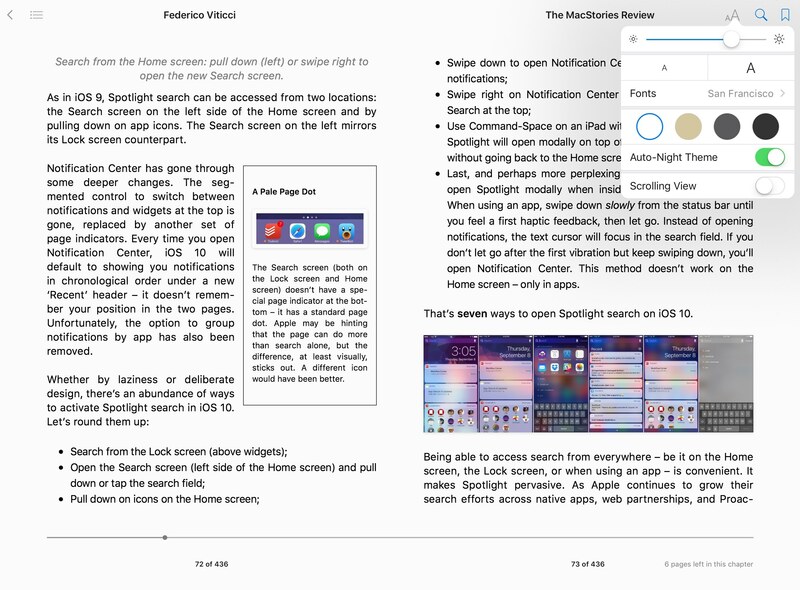 The eBook version contains all the media (screenshots and videos) of the web version, including eBook-specific layout optimizations. The eBook can be downloaded from the member Downloads area (to download files on iOS, see here). In addition to the eBook, we'll publish an exclusive Making Of newsletter for Club MacStories members later this week. In the Making Of, you'll be able to read more about my writing process, interesting review stats, the image workflows we used, and how this special web layout was put together. Get exclusive extras and support MacStories by signing up for Club MacStories today.